Space per pupil: 120 sq.ft. Brazosport College opened its doors in 1968 to serve the needs of the Lake Jackson community. The original curriculum catered to students seeking employment in local petrochemical and refining industries along the Texas Gulf Coast. 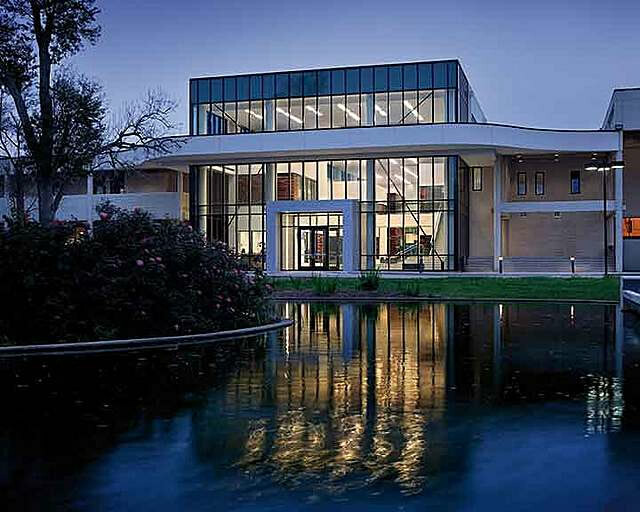 In 1968, Brazosport College commissioned the internationally known Houston design firm of Caudill Rowlett Scott (CRS) to design a new main campus building to serve as the heart of the college. The building opened its doors in 1971 and received numerous architectural awards in the following years. The original structure was made entirely of precast concrete on a modular bay and was infilled with burnished concrete block and lightweight concrete plank floors and roof. The entire system was designed to be easily expandable and grow with the demands of the college. Nearly 40 years later, the college made its first significant changes to the campus with three separate, but significant projects. In 2008, a student commencement center and a health professionals building were added but disconnected from the main campus building, thus the relationship to the original CRS building could afford to separate itself from the rigidness of the structured grid. The latter of the three projects began in 2010. The college commissioned a major renovation and addition to the original main campus building. The two largest components of the project include infilling an existing courtyard as a Student Life Center, and renovating the existing two-story volume library. 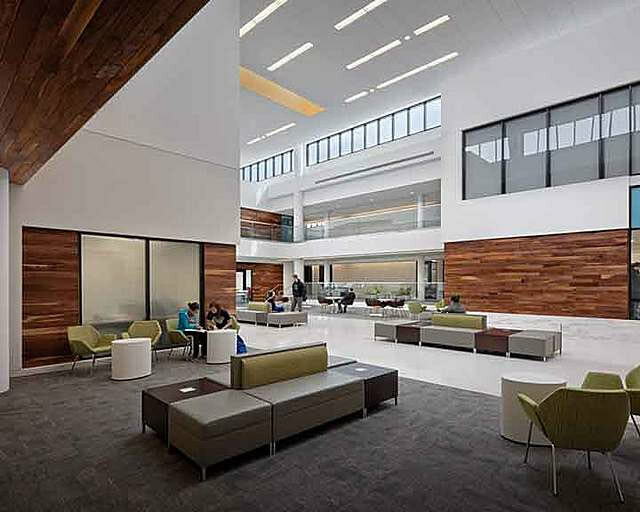 The college emphasized the importance of respecting the original CRS design, so great lengths were taken to preserve existing finishes and structural components. The new addition and renovations complement the original material pallet of light concrete, dark wood and bronze frames and hardware. Since the early planning stages for the project, the owner and the design team shared a similar vision that the student center and library should become an academic village within the heart of the main campus building; a destination spot rather than a pathway required to get to classes. Conceptually, the design team wanted to create large open areas populated with towers, bridges, lookout perches, and other nooks for studying, tutoring, and student-led events. Creating an atmosphere that was the antithesis of the heavy, brutalist-style design of the CRS building was an overwhelming task initially. 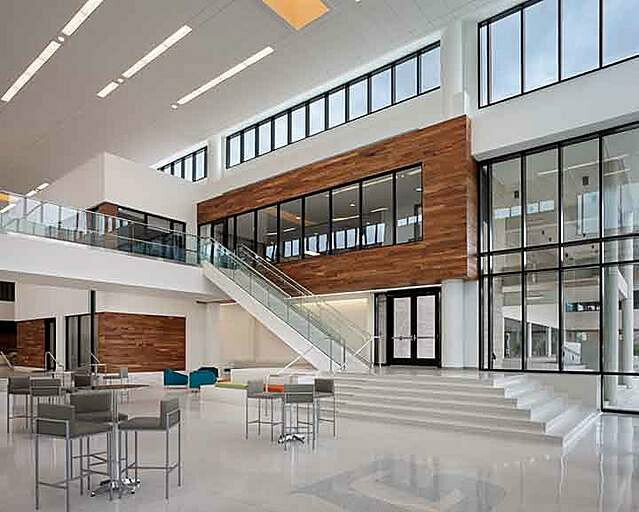 There were four key components the owner knew were critical to the success of the project: crafting a variety of gathering spaces in all different sizes, creating high volume and low volume spaces, incorporating a light and airy pallet of colors and materials, and drawing natural light as far as possible into the building. The existing student spaces within the main campus building were few and far between. Brazosport College caters to the commuter student, since there is no on-campus living, and these students simply made-do as they waited throughout the day for classes to start. 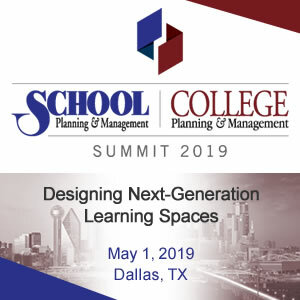 Historically, there was no previous desire or mandate to create student-driven, student carved spaces that were meant to be social or study areas. Students simply hunkered down wherever they could find a quiet spot to study or hang out. Likewise, faculty has never had a place to call their own, where they could stop and chat with fellow faculty at the proverbial water cooler. 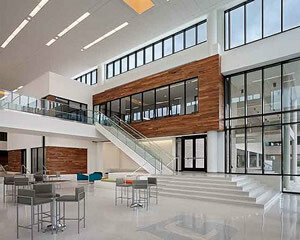 The design team wanted to create within this “village” an opportunity for students and faculty to mingle and experience all that a highly functional Student Life Center has to offer. Within the new student center space we wanted the towers and nooks to have soft-seating areas for lounging, great acoustics in small spaces for studying, proper lighting, technologically supported spaces for tutoring, and open areas for student-led events where discussions and presentations could take place. Interstitial spaces between boxes, reminiscent of a village streetscape, serve as circulation space that can encourage collaborative learning and chance encounters. 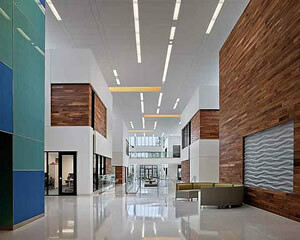 Utilizing these leftover spaces can produce great efficiencies within the floor plan. The design team also leveraged a three foot drop in elevation between the floor of the library and the exterior entry at the opposite end of the SLC, and this transition, made with a series of stairs and ramps, further enforces the village streetscape feel. While the new student center was inserted into an existing u-shaped form of the main campus building, the library renovation posed a new set of issues and challenges. 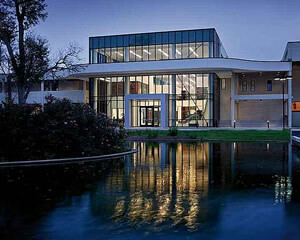 The library resides in the very center of the main campus building. 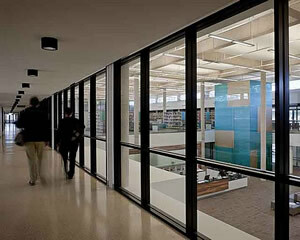 While clerestory elements were built into the original design, many areas of the library were dark and lifeless. Getting natural light into the middle of the building was difficult, and cutting new openings into the existing concrete waffle-slab designed roof was not an economical solution. The two-part solution led to incorporating large skylights into the roof structure of the student life center, thereby flooding the adjoining space with natural light while removing building elements between the two spaces that would block or diffuse the light. 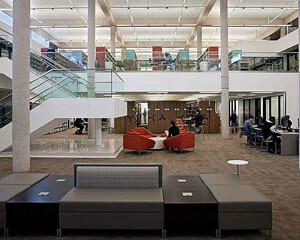 The result was that more light was able to reach the library into strategically located study areas and research carrels. Trying to make connections between new and old utilities and extend utilities from existing buildings into the new building was also challenging. The library boasted exposed concrete beams and we wanted to be sensitive to the original design elements, so we carefully routed utilities so they would not detract from the architecture. We also had to contend with routing water lines for new sprinklers through a typical 1960s structure that had limited height and plenum. In-depth coordination with the general contractor allowed the design team to raise certain areas of the ceilings where main utility lines and plenums could be expanded. 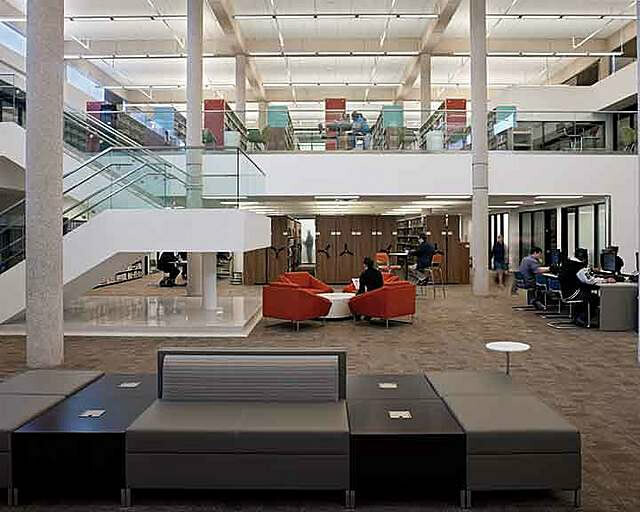 We wanted to change the dynamics of the library and how it operated so we infilled double-height spaces with a second floor to accommodate more stacks. We added an elevator for convenience by busting out the slab and putting an elevator in the existing library, all under the existing poured-in-place concrete roof. A ground level learning and testing center was also added, in addition to a new circulation desk and stair. 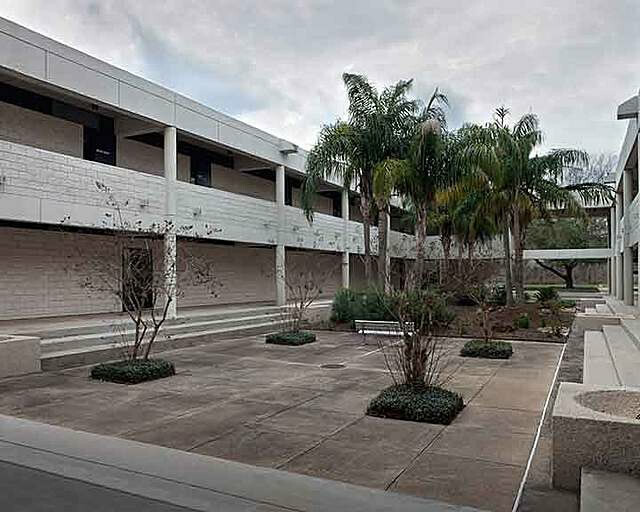 Incorporating color into the existing brutalist-style building was essential to create a comfortable, collaborative atmosphere for students and faculty. We utilized colored glass panels, stained wood siding, brightly colored furniture and painted the skylight wells orange and yellow to warm up the space. BIM (Building Information Modeling) was used to meet an accelerated construction schedule facilitating coordination between the A/E team and the contractor and enabling the project to be completed on time and within budget.